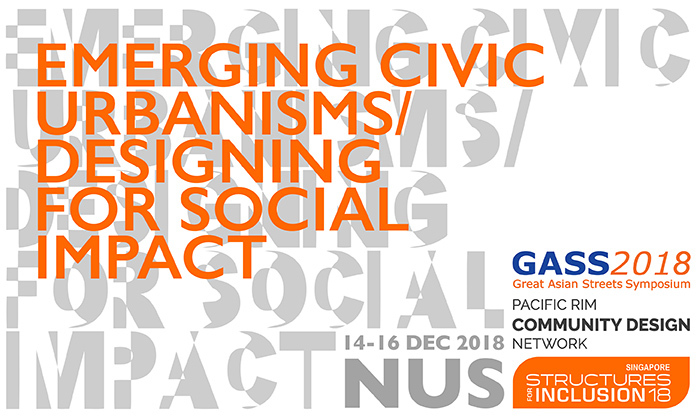 Announcing Structures for Inclusion 18: “Emerging Civic Urbanisms / Designing for Social Impact” hosted by the Department of Architecture at the National University of Singapore, December 14-16 this year. Conference presentations will include the winners of the SEED and Pacific Rim Awards for Excellence in Public Interest Design. Design Corps and SEED Network are partnering with the Pacific Rim Community Design Network to launch these awards. Please see here for eligibility, criteria, and requirement for submission, etc. — https://designcorps.org/seed-awards-about/. All complete award submissions will be located on the Design for the Common Good world map of public interest design projects — http://www.designforcommongood.net/map/. Deadline for award submission is July 15, 2018. For conference information, registration and updates, please follow the link http://gass-prcdnet-sfi2018.org. If you have any questions about the conference, please contact the conference secretariat at gass2018@nus.edu.sg. Looking forward to seeing you in Singapore this December!